You are going to love this cucumber tomato quinoa salad on a hot summer afternoon. Simple to assemble, easy to make, and packed with nutrition. This salad is vegan, gluten-free, and with a little preparation ready in under five minutes. Yes a tasty, nourishing lunch or dinner in under 5 minutes is just what we love over at Pancake Warriors. This is Sam from Pancake Warriors and I’m excited to bring you some of my tricks of the trade as a Nutrition Coach. There are a few items I try to keep in my fridge all the time. One of them is at least 4 or 5 cups of cooked quinoa. Quinoa only takes 15 minutes to make, and you can make 5-6 cups as quick as 1 cup, so I always make a bulk batch. What do I do with the leftovers? Check out these yummy samoa cookies or these carrot cake energy bites. To make sure we always have healthy options throughout the week, I usually do at least one hour of meal prep on the weekend. During this time, I cook a batch of quinoa, roast veggies and sweet potatoes, wash and cut veggies and even get some proteins ready for the week. I don’t bother seasoning these items, that way they are available for me to use however I want during the week. This cucumber tomato quinoa salad is the perfect way to enjoy quinoa on a hot summer afternoon. And since I already had quinoa on hand this is ready in like three minutes flat. To build flavor and used red wine vinegar and fresh flat leaf parsley. Do you cook with fresh herbs often? If not, I really think you should! Fresh herbs are a great way to add flavor and a ton of nutrition without a ton of added calories. So many of my clients claim that they aren’t very proficient in the kitchen and “can barely boil water”. 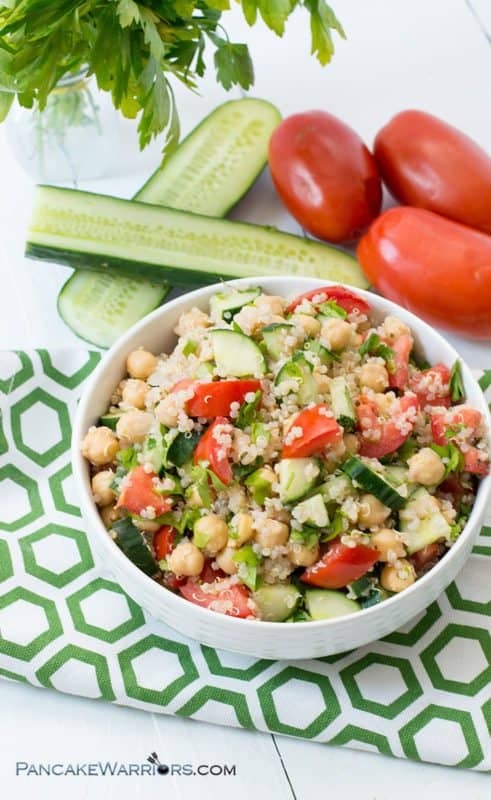 This cucumber tomato quinoa salad is the perfect salad to start your cooking adventure with. Trust me as soon as you taste this yummy salad, you are no longer want to eat that microwave meal for lunch. After all they are both ready in about three minutes. I always encourage my clients to fill up on whole foods not processed manufactured foods if they want to feel their best while also trying to slim down or put on muscle. 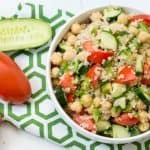 This cucumber tomato quinoa salad is bursting with flavor and I guarantee you will leave you full and satisfied, which is much better than the way I usually feel after eating a microwaved meal. 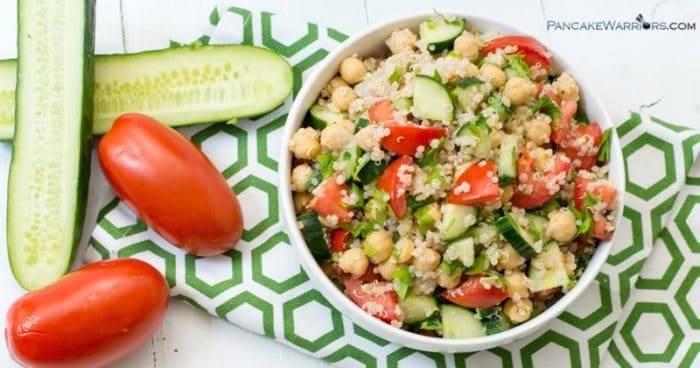 This cucumber tomato quinoa salad is the perfect, filling salad to enjoy on a warm summer afternoon. Ready in under 5 minutes, this salad is vegan, gluten free and so simple to assemble! 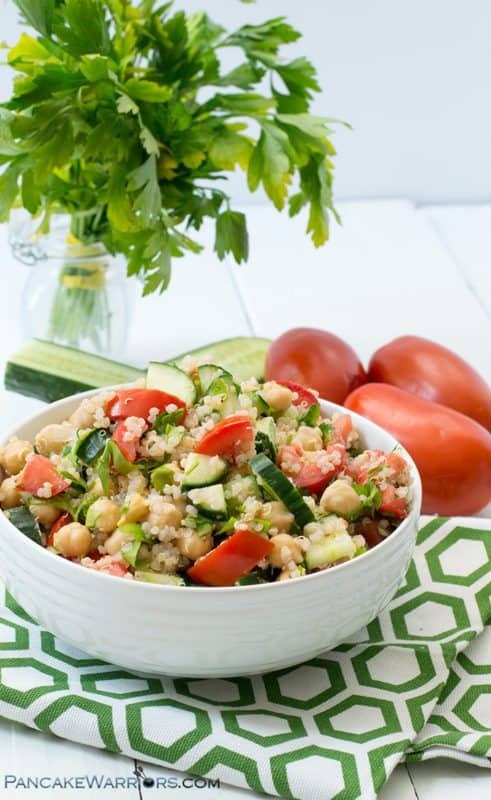 In a large bowl combine the cooked quinoa, rinsed chickpeas, chopped tomato, chopped cucumber and chopped parsley. In a small container with a tight fitting lid, add the red wine vinegar, olive oil, salt, garlic powder, onion powder, and oregano. Add the lid and shake vigorously. Pour the dressing over the tomato cucumber quinoa salad and mix well.